The long-term assessment of another team of researchers, however, turns this horizon of expected ends on its head. The sightings of large mammals in the Zone, biologists Timothy Mousseau and Anders Møller argue, are anecdotal and the fanfare over those sightings obscures the real chaos taking place a few notches down the animal kingdom, where the long-term presence of radiation simulates, in some respects, what the “hour” of extinction might look like for certain birds and small mammals. They write, “The best-studied group, birds, shows a 50 percent decrease in species richness and a 66 percent drop in abundance in the most contaminated areas compared to areas with normal background radiation in the same neighborhood” (2011:38). In areas of moderate to high contamination, Mousseau and Møller report dramatically higher mutation rates and developmental abnormalities and lower rates of survival and fertility (ibid.). 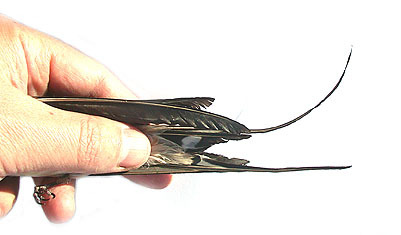 Radiation is causing not only unusual tumors in the beaks of barn swallows and wing discoloration, but also, by dint of those and other physiological impacts, radiation acts as a kind of bio-ecological solvent in which the recruitment of potential mates is compromised, reproduction rates decline, species go missing, and animal die-offs take place. These findings raise questions about the very nature of extinction, or of how certain parameters of its recognition strategically coalesce in particular times and places under threat. Recognition is a strong meta-theme here. As art historian Mitchell Merback (2012) shows in his compelling analysis of the “witnessing figures” depicted in late medieval altarpieces of the Crucifixion scene, recognition can take on a plurality of forms. It is a “dawning of comprehension” and “a spectrum between seeing and blindness” that can also include “half-unfolded” disclosures, false inferencing, and “blind seeing”—all of which can stand in the way of critical discoveries. If survival is a fairly straightforward logic of dispersal and ecological opportunism, as the “zone-as-ecological wonderland” thesis suggests, then what accounts for the voids and extirpations that underpin this movement? How is extinction to be seen? In 1859, Charles Darwin celebrated evolution’s “endless forms,” notably the “higher animal,” as the “most exalted” object emerging from nature’s war, famine, and death. In what Darwin called the “entangled bank” of ecological interconnections and die-offs, he found the origin of species. The proximate cause of life was (some animal’s) death. The proximate cause of death was (some animal’s) life. The Zone’s ecology prompts questions not unrelated to these seamless activities in which survival and extinction comprise two sides of the same coin. While ideas of survival and reproduction as relatively mechanistic processes of natural selection still win the day, the observable parameters of extinction—beyond a failure to adapt—have yet to be empirically worked out (Geertz 2005). Do evolution’s endless formations have a time-stamp or a limit? What difference do mutagens like radiation introduce? What, we might ask, are the origins of extinction? We can take the debate over the ecological integrity of the Zone as being directly relevant to how the fate of species is being inferred scientifically under various scenarios of environmental threat. The fate of the missing Chernobyl barn swallows provides a small window into the scientific challenges facing researchers in their increasingly concerted and urgent efforts to discern the causes and dynamics of species extinctions for the purposes of improving conservation strategies, particularly as they relate to climate change (Cahill et al 2012; Griffen and Drake 2009; Pimm 2009; Sæther et al. 2000, for example). What, ecologists ask, are the appropriate scaling rules and measures for the “final decline to extinction” (Griffen and Drake 2009)? As the effects of climate change accelerate, scientists face the limitations of available tools to infer and predict when, where, and how extinction happens. Can population-based extinction processes still be knowable through statistical probabilities? Is extinction reducible to a moment when some threatened species reaches a critical limit of physiological tolerance (to heat, for example)? What does extinction, near-extinction, or the hour of extinction look like? Mousseau and Møller can only offer conjecture as to how the decline of barn swallows in the Zone occurred (2011:43). It is possible, they write, that exposure to radiation overtaxes the bird’s stores of antioxidants, needed to fight oxidative stress. Long-distance and particularly brightly colored migrants (their yellow and red feathers, crucial for attracting mates, are powered by carotenoids) arrive already severely antioxidant-depleted at their annual breeding sites and may not have in them the extra antioxidants needed to fight radiation. They may never arrive or arrive exhausted and unable to breed in a Zone that is neither a wonderland nor wasteland, but a biogeographical place in which any number of causes and so-called stochastic factors can interact to cause a species to defy local ecological expectations. Population viability estimates have traditionally relied on statistical analyses to determine probabilities of long-term population declines (Sæther et al. 2000:624). A variety of stochastic (or idiosyncratic) dynamics, however, confound efforts to make inferences about the “actual time to extinction” (my italics, ibid.). Extinctions, particularly near-extinctions, are not transparent phenomena. What may look like an adaptation to increasing temperatures due to global warming—say, an animal reaches a physiological limit of heat tolerance and moves up a mountain or poleward—may be the scene of a fatal “temporal mismatch” in host-predator interactions, as hosts and predators may not migrate at a similar pace (Pimm 2009:R600; Cahill et al. 2012:2). Indeed, the mutagenic properties of climate change—if they can be characterized as such—are difficult to discern as they can produce images of both species abundance and species decline. Mismatched timing and other idiosyncrasies of species survival make for a peculiar and non-parametric “borrowed time” scenario (Hughes et al. 2012). Modeling when and where an animal population dies off, when and under what conditions it breaks the entangled bank, so to speak, becomes a formidable task. And while there is no clear signal for extinction, there is the “disturbing possibility that there may be many extinctions due to other proximate causes long before physiological tolerances to high temperatures become predominant” (Cahill et al 2012:7). Somehow, our knowledge of extinction may never be enough. Is the Zone an ecological wonderland or a post-industrial wasteland? Scientists and the rest of us will have to wrestle with the false dichotomies that the Zone has enlisted. Similarly, we must cut through the “blind seeing” that defines our current state of recognition of species extinction. Sudden and difficult-to-reverse processes may involve complex spatial and temporal dynamics that, we might say, have been poorly horizoned thus far. Already causing significant human and ecological disruption, the doubling of CO2 emissions in the next few decades begs for better ways of apprehending the poorly understood dynamics of species extinction. In this space of imperfect knowledge and inexorable threat, the origins of extinction usher in a new kind of intellectual labor, a “horizoning work” (Petryna 2012), involving the construction of empirical tools and appropriate “scaling rules” (Griffen and Drake 2009) for recognizing and “maintaining a safe distance from dangerous thresholds” (Rockström et al. 2009 cited in Hughes et al. 2012:6). Horizons here act as contemporary “equipment” (Rabinow 2003) for cultivating distance as well as signaling available time for modeling, managing, and facing a complex future that is seemingly right at hand. The centrality of such horizoning work cannot be underestimated in ecological research, as the uncertainty of previous models and unprecedented threats have prompted a search to identify “proximate factors causing extinction from climate change” (Cahill et al. 2012:2). Owing to some alluring, and maybe deadly, cognitive dissonance, the Zone is popular among disaster tourists. Yet the preoccupation with dangerous thresholds, extinction barriers, and declines also tells of the level to which horizons and horizoning work become ever-more central to our own political thought and practice. Baker, Robert J., and Jeffrey K. Wickliffe. 2011. “Wildlife and Chernobyl: The Scientific Evidence for Minimal Impacts.” Bulletin of the Atomic Scientists, April 14. Cahill, Abigail E. and Matthew E. Aiello-Lammens, M. Caitlin Fisher Reid, et al. 2012. “How does Climate Change Cause Extinction?” Proceedings of the Royal Society. 280(1750):1-9. Geertz, Clifford. 2005. “Very Bad News.” New York Review of Books, March 24. Griffen, Blaine D. and John M. Drake. 2009. “Scaling Rules for the Final Decline to Extinction.” Proceedings of the Royal Society 276(1660):1361-1367. Hughes, Terry P. and Cristina Linares, Vasilis Dakos, Ingrid A. van de Leemput, and Egbert H. van Nes. 2012. “Living Dangerously on Borrowed Time During Slow, Unrecognized Regime Shifts.” Trends in Ecology and Evolution, 28(3):149-155. Merback, Mitchell. 2012. “Recognition: Theme and Meta-Theme in Northern Renaissance Art.” Lecture, School of Historical Studies, Institute for Advanced Study, Princeton, NJ. Oct 23rd. Mousseau, Timothy A., and Anders P. Møller. 2011. “Landscape Portrait: A Look at the Impacts of Radioactive Contaminants on Chernobyl’s Wildlife.” Bulletin of the Atomic Scientists 67(2):38’46. Petryna, Adriana. 2012. “What is a Horizon?” American Anthropological Association Meetings, San Francisco, CA, Nov 14. Pimm, Stuart L. 2009. “Climate Disruption and Biodiversity.” Current Biology 19(14):R595-R601. Rabinow, Paul. 2003. Anthropos Today: Reflections on Modern Equipment. Princeton: Princeton University Press. Rockstrom, Johan, et al. 2009. “Planetary Boundaries: Exploring the Safe Operating Space for Humanity.” Ecology and Society 14(2):32. Sæther, Bernt-Erik, Steinar Engen, Russell Lande, Peter Arcese and James N.M. Smith. 2000. “Estimating the Time to Extinction in an Island Population of Song Sparrows.” Proceedings of the Royal Society 267(1443):621-626.